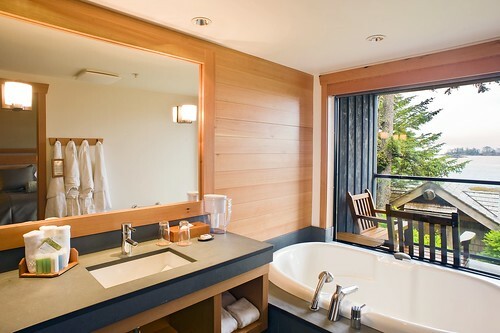 More than five weeks ago, the carved cedar doors of Tofino’s Wickaninnish Inn were closed to allow the illustrious resort time to refresh and refurbish itself. Under the direction of BBA Design Consultants and with contractors from Tofino, Ucluelet, Port Alberni and Parksville, “The Wick Inn” – as it’s lovingly known – is ready to once again welcome guests. Among the renovations includes the 45 original guestrooms within the Wickaninnish-at-the-Pointe building, having received reviving, genuine West Coast detailing. Featuring the same warm and welcoming standards as the Beach rooms, these guestrooms are set to re-open in March. Now nearing its completion, perhaps the most notable addition is the Sea Cave steam room within the Ancient Cedars Spa. Spa guests can enhance their relaxation by adding the steam room to any of the various treatments, services and yoga options offered by Ancient Cedars Spa. To celebrate the re-opening of the Wickaninnish Inn and Ancient Cedars Spa, the resort has a special offer for guests over the month of March. Visitors who book a minimum three-night stay at The Wick Inn before March 31st will receive $100 off their nightly room rate. Escape to rustic elegance on nature’s edge with a visit to the Wickaninnish Inn. The resort is located minutes from downtown Tofino at 500 Osprey Lane. For more information on the Wickaninnish Inn, Ancient Cedars Spa or The Pointe Restaurant, visit The Wick Inn’s website. You can also follow their updates on Twitter or become a fan on Facebook. Until March 5th, you can win $250 in Seaflora Wild Organic Seaweed Skincare product. Enter here!